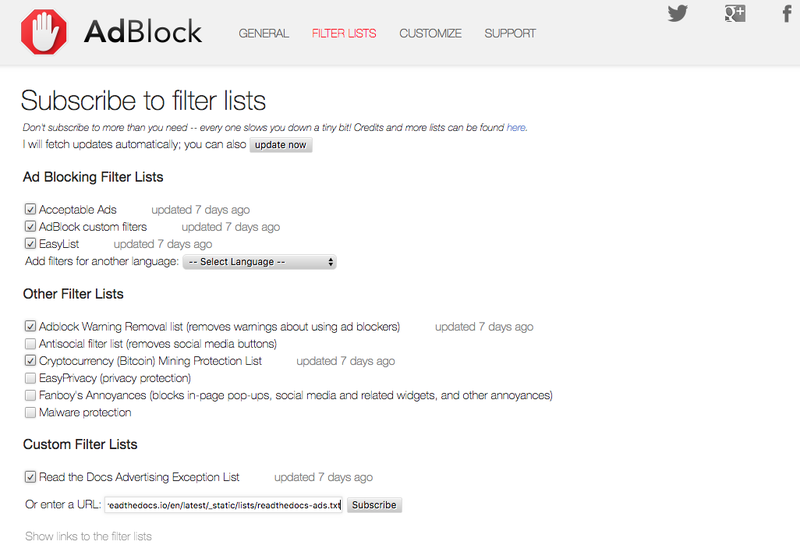 Adblock lists, whether filters that block additional items or allow exceptions like the ones here, can be installed on every major adblocker. Here are the installation steps on the three biggest adblockers. Click on the ABP extension icon on your browser and choose “Options”. 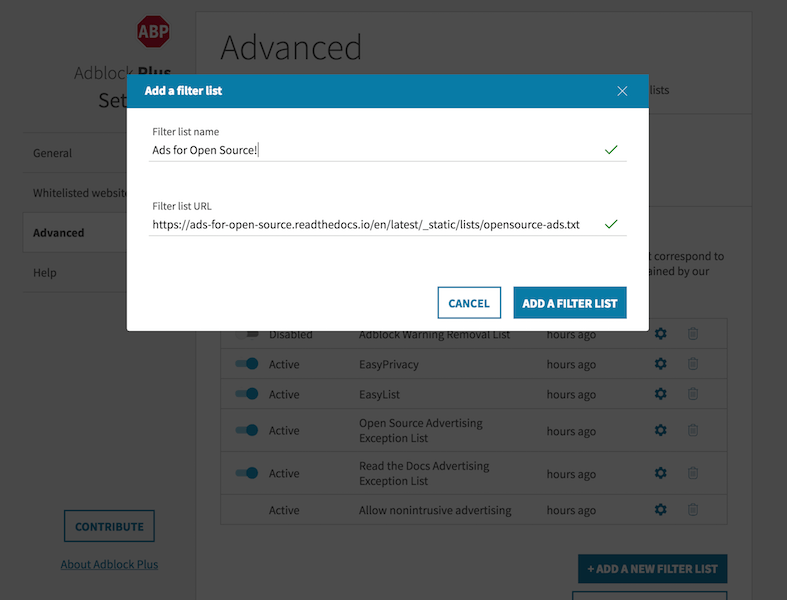 Enter the URL of the list you want to subscribe to (Open Source Ads, Read the Docs Ads), give it a name, and lastly click the “Add a filter list” button. Click on the Adblock extension icon on your browser. 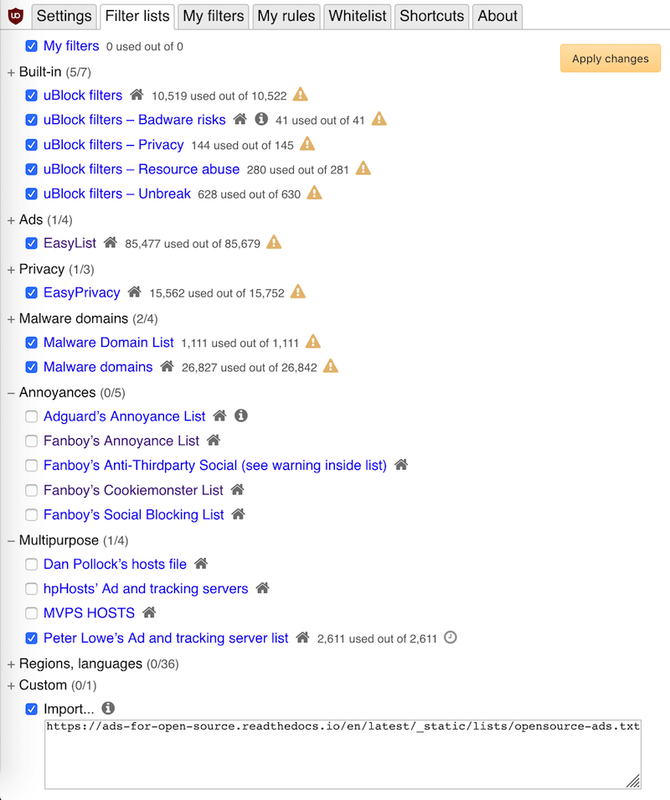 Under the “filter lists” tab in the “Custom Filter Lists” section, enter the URL of the list you want to subscribe to (Open Source Ads, Read the Docs Ads) and lastly click the “Subscribe” button. Click on the uBlock Origin extension icon on your browser. Click the slider / settings icon to open the “Dashboard”. Under the “Filter Lists” tab, scroll to the bottom where it says “Custom” and click the “Import” checkbox to reveal the custom URL textbox. Enter the URL of the list you want to subscribe to (Open Source Ads, Read the Docs Ads) in the textbox and lastly click the “Apply changes” button in the upper right.